Tucker is a streetwise city mouse. He thought he'd seen it all. But he's never met a cricket before, which really isn't surprising, because, along with his friend Harry Cat, Tucker lives in the very heart of New York City—the Times Square subway station. Chester Cricket never intended to leave his Connecticut meadow. He'd be there still if he hadn't followed the entrancing aroma of liverwurst right into someone's picnic basket. Now, like any tourist in the city, he wants to look around. And he could not have found two better guides—and friends—than Tucker and Harry. The trio have many adventures—from taking in the sights and sounds of Broadway to escaping a smoky fire. Chester makes a third friend, too. It is a boy, Mario, who rescues Chester from a dusty corner of the subway station and brings him to live in the safety of his parents' newsstand. He hopes at first to keep Chester as a pet, but Mario soon understands that the cricket is more than that. Because Chester has a hidden talent and no one—not even Chester himself—realizes that the little country cricket may just be able to teach even the toughest New Yorkers a thing or two. 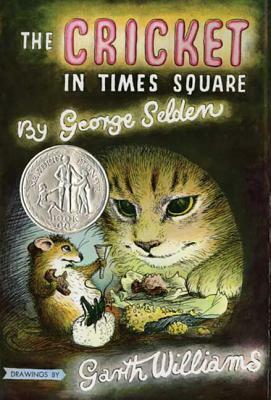 George Selden (1929-1989) was the author of A Cricket in Times Square, winner of the 1961 Newbery Honor and a timeless children's classic. Born in Hartford, Connecticut, Selden received his B.A. from Yale, where he was a member of the Elizabethan Club and contributed to the literary magazine. He spent three summer sessions at Columbia University and, after college, studied for a year in Rome on a Fulbright Scholarship. People often asked Selden how he got the idea for The Cricket in Times Square. "One night I was coming home on the subway, and I did hear a cricket chirp in the Times Square subway station. The story formed in my mind within minutes. An author is very thankful for minutes like those, although they happen all too infrequently." The popular Cricket series grew to seven titles, including Tucker's Countryside and The Old Meadow. In 1973, The Cricket in Times Square was made into an animated film. Selden wrote more than fifteen books, as well as two plays. His storytelling blends the marvelous with the commonplace realities of life, and it was essential to him that his animal characters display true emotions and feelings. Garth Williams (1912-96) illustrated all seven of the Chester Cricket books and many other works, including Stuart Little and Charlotte's Web.